With upgrading technologies, tremendous options are available to manage electricity usage at home. Smart Home System is not new, yet previously complicated and expensive, out of people’s reach. The biggest factor of change is the rise of wireless technology. Nowadays, we carry smartphones in our pocket that is enough to handle powerful tools to make life easier. How to save energy using Smart Home System? Smartphone – One of the recent digital innovation is integrated technological systems in home. Transforming home into Smart Home is the appropriate way to control enormous activities at home. 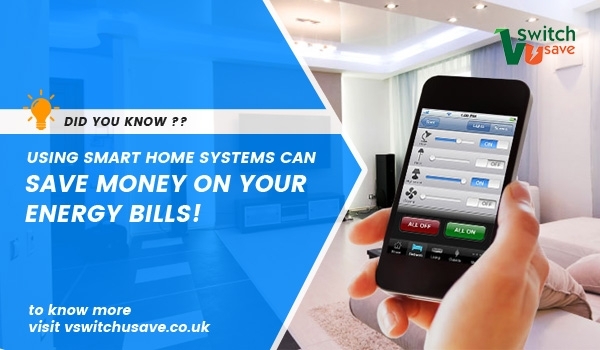 Using smart technology, you can check all devices are powered on or off at a glance from your phone. Even, you can leave them on the standby mode and then activate when required. Some complex control systems allow you to turn on smart thermostat by tracking location when you return home. Lighting – There are huge number of companies who produce smart bulbs. Smart bulb consists of LED (Light Emitting Diode) bulbs having Wi-Fi connection. It is easy to install at your house. Once it’s installed you can access it through an app on phone or tablet. Smart Switch – Another convenient method is to install a smart switch. This switch will help in plug in or plug out remotely doesn’t whatever it is appliances, lamps, media devices etc. Smart plug – It is connected in a similar manner as extension cable but the control system is not attached to any bulb or appliance, so you can easily move it. This is less costly as you can manage multiple devices with it. Decreases chances of accidental house fires from unattended ovens. Allows owner to keep eyes on visitors to protect from suspicious activities. Helps you tracking the location of family members after they leave house especially for children and old people. Learns voice commands quickly to manage activities with an elder or disable people to make their life comfortable. Makes appliances work with least amount of energy. Even, it reduces overheating of pans. In order to use smart home system, keep control system or Wi-Fi router in on mode all the time.